As technology allows things to be made smaller and smaller, it's become even easier to misplace your most valuable stuff. Thankfully, it also means there're new ways to keep tabs on it all from afar. In fact, two different companies have recently debuted miniature devices that do just that. And because you're busy researching more tiny gadgets to buy, we compared each's strengths and weaknesses. What it is and what it does: A 2in, Bluetooth-enabled square piece of plastic that can be tied or stuck to keys/passport/laptop/pets, whose location can be tracked via a dedicated app that monitors up to 10 simultaneously. It crowdsources the location of stolen/lost items out of range by pinging other Tile users' phones who come near it, and plots the approximate whereabouts on a map. What it is and what it does: A small device you throw in your luggage that will let you know its location via text message once you've landed after a flight, providing info you can give airline customer service should it be stranded in a different city. And thanks to limited Bluetooth range and a special app, it can guide you toward the right bag on the carousel. 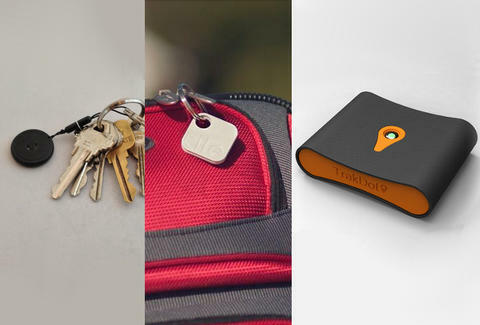 What it is, and what it does: A quarter-sized, Bluetooth-enabled disc that can be tied or stuck to keys/passport/laptop/pets, whose location can be tracked via a dedicated app that tracks up to 10 simultaneously. It crowdsources the location of stolen/lost items out of range by pinging other TrackR users' phones who come near it, then plots the approximate whereabouts on a map.